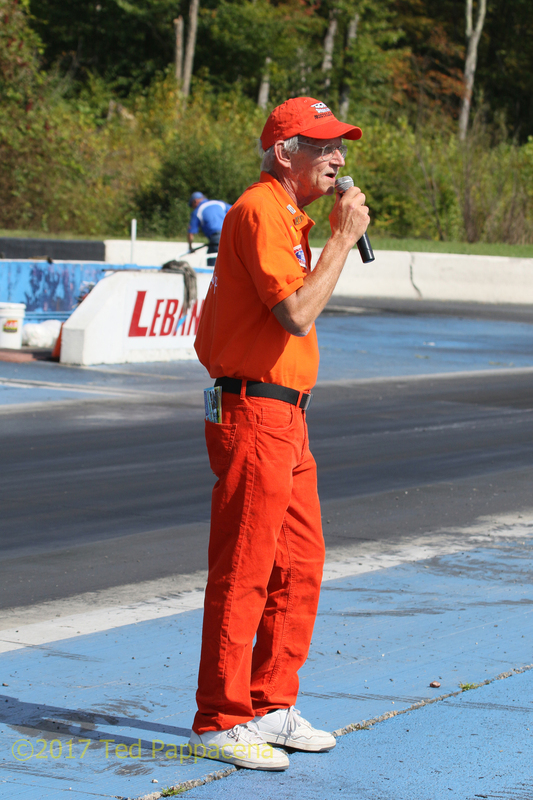 The 9th annual Dover Dragstrip Reunion held each year at Lebanon Valley Dragstrip in West Lebanon, New York is over and in the books. As I think what to write, it would be very easy to say, “See last year’s report” and add the words “Ditto, only bigger”. But that would be a cop out and no fun for me to tell you about how great this event is. It truly amazes me how Dino (Lawrence) puts this event on at this track each year and it keeps getting bigger, so much so that another day has been added to next years’ edition. And it’s much needed I might add. There were more people and cars than last year. The line for the cars to get in to race was enormous. If only we could smell this photo, our eyes would be tearing! More feature cars were added as well. This year saw the highly touted return of Rocky Roxlau’s “Time Bomb” Vega going against Chuck Exton’s “Wild n Crazy” Mustang. The Bomb is running on alky while Chuck’s Mustang has that yellow juice in its fuel lines. However, the Bomb couldn’t make the call due to parts attrition with the motor. It was the third motor for the Bomb this year and it wasn’t happy leaving too much metal in the oil filter. Luckily, Keith Davidson’s gorgeous “Bits N Pieces” Firebird was on the premises as an alternate, so he filled in for the Bomb. The first run saw Keith leave on Chuck but Chuck ran him down with 6.62/213 mph. Chuck told me that he was going to put everything but the kitchen sink into the motor (Chevy truck block don’t forget) for the second round and perhaps go out in a blaze of glory (for the motor). Fortunately he didn’t, got left on again, and chased the Firebird down again for the win with a 6.70/211 mph. Keith shut it off at the 1000” mark and still went an admirable 6.92. Chuck’s 6.70 was on 7 cylinders! A good friend said it’s impossible to take a bad photo of War Path. He’s right! Also on hand were the alky funny cars of John Cerchio and George “Hollywood” Reidnauer. John’s candy apple red “War Path” Buick Somerset was on hand to try to slay George’s fire breathing dragon Corvette called “Excalibur”. 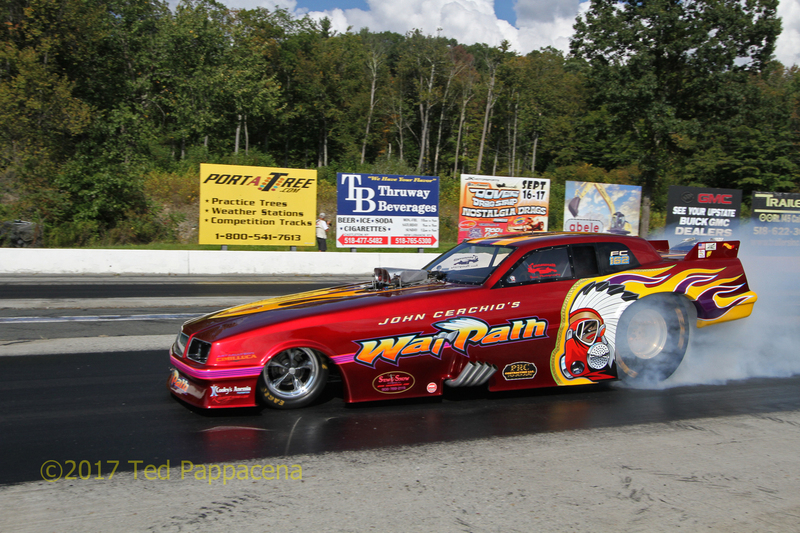 In the first round, War Path tried with a 7.21/194 mph but could not stop Excalibur’s devilish 6.66 /197 mph charge. 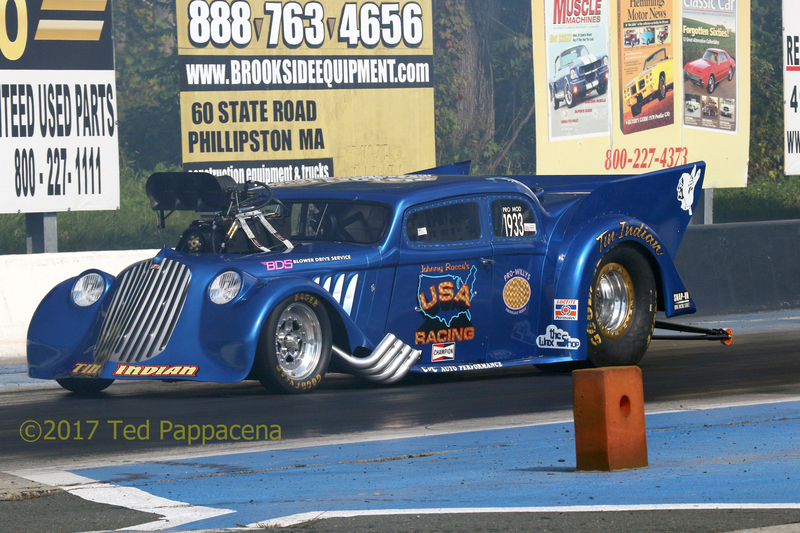 In the second round Excalibur laid down low E T for the meet 6.52/205mph. Just after starting, War Path had transmission problems and had to shut off. Last year, a lone fuel altered was on the property. This year, instead of one, there were 4! 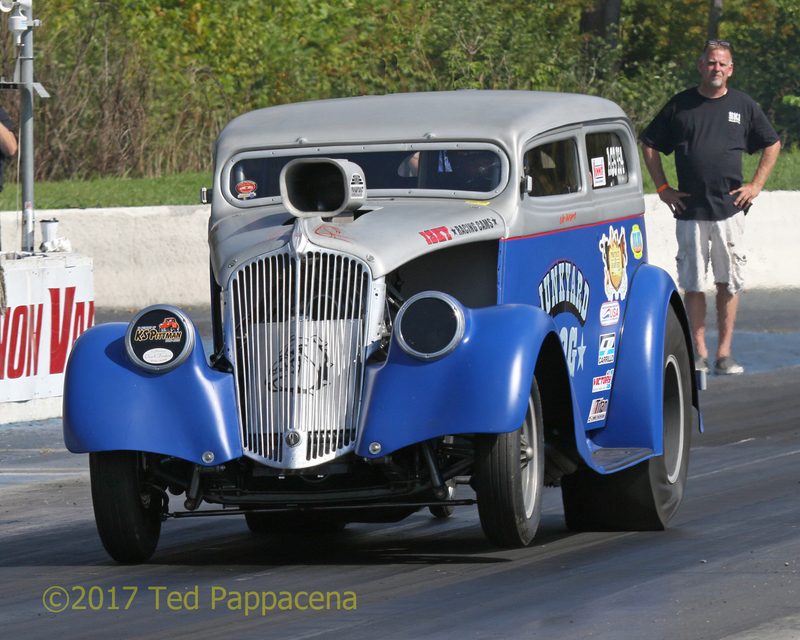 The group consisted of Mike Geroni’s Fiat, Bill Kraus & Sons “Altered Attitude” T, John Hadyniak in Tony Mazzarella’s “Hell Bound”, and Paul Athay in Bob Sweatland’s “Tin Indian” Willys. The New York Earthshaker was supposed to be there but destroyed the motor a few weeks earlier at a show at ATCO so “Hell Bound” was pressed into service. The “Tin Indian” you might recall is a Pro Mod 33 Willys built and campaigned by Johnny Rocca in the 90s, but this day it was an “altered”. They all made flawless runs but if there were a burnout contest (Dino-maybe next year?) Mike Geroni would have won it hands down. 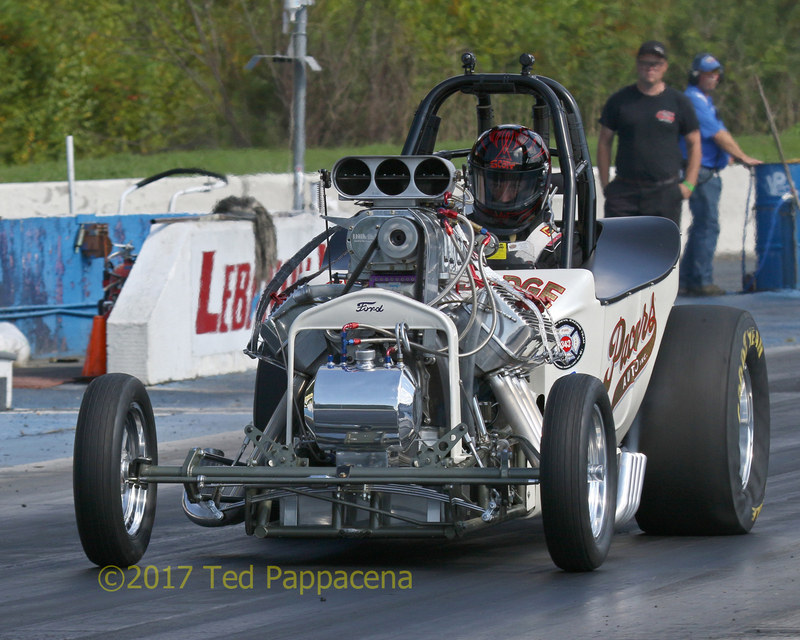 Also on hand was the famed Pacers fuel altered owned by George and son Scott Snizek. The Pacers from Oceanside N Y was a force to be reckoned with in the early to mid-sixties and was a NHRA record holder for a couple of those years. The car is a tribute to the original built and raced by Jerry Joquin of Arizona and the Snizeks were able to purchase it a few years ago. They only made exhibition passes to the 1/8th mile. Sunday saw the car’s throttle linkage break just past the 1/8 mile mark but Scott managed to it get it stopped right before the sand trap. Whew! 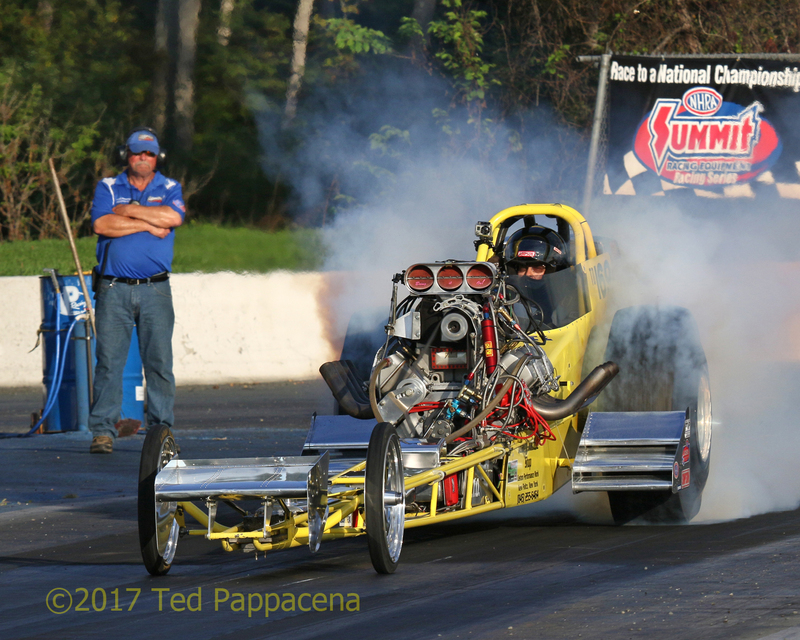 As if all this wasn’t enough, supercharged gassers were also added this year. Advertised were Jim Oddy’s (yes, that Jim Oddy) Junkyard Dog 34 Willys sedan and Al Niespodzinski’s Caged Heat 33 Willys. But, 4 were in the show and the other 2 were Mark Korzaniewski’s Danny Newell driven Calamity Jane 33 Willys and Tom Fritz’s Going Broke II 41 Willys pickup. Even though they only ran the 1/8th mile in my eyes they put on one heck of a show and from what I’m told there will be more added next year. But wait, there’s more! Bob Sweatland’s Lil Miss Behavior Corvette alky funny car was paired up against Al Paereckis’ 67 Chevelle P/M twice as well as Charlie Benson in the Bad Boys Racing A/F/D going up against the Black Diamond A/FD of Jeff Lawrence. Just so I don’t forget there was 2 days of N E T O and the East Coast Gassers plus 8 eliminators, a giant car show, and the famed “Drag Alley Nostalgia Race Car Display” and a B U G Contest. If it gets any bigger, Dino will need a whole week to fit it all in.